ImmerVision has been promoting the 'world's smallest panomorph lens', a lens that will be more than 80% smaller than its existing surveillance line. With interest growing in panoramic surveillance, what impact will this release have? In this note, we examine the details and compare to rival offerings. The main focus of ImmerVision's press release, a 6mm miniature panomorph lens, is intended for use in consumer devices, not security applications. ImmerVision informs us that this lens should be in products brought to market by the end of 2012. However, ImmerVision does not believe this will be used in security products. The secondary announcement of the press release, ImmerVision's board-mount megapixel panamorph lens design, will have impact on the surveillance market. This lens is to be supplied as component by a major lens manufacturer to third-party camera providers, effectively creating a line of ImmerVision Enables minidomes, marketed and sold by multiple manufacturers. 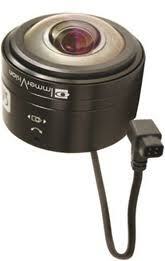 According to ImmerVision, the first cameras developed with this lens design should be shown in Fall 2012, at ASIS. ImmerVision-equipped cameras are also mounted differently than typical cameras, due to their vertical orientation. Some housings are available which improve these issues, but there are few outdoor options, leading to oversized domes being used. Integrated minidomes should provide a more compact assembly, and indoor/outdoor options. This lens design is not intended for retail sale, unlike their commercially available IMV lenses. Where the IMV series sells for $500 USD online, resulting in an overall box camera + lens cost typically well over $1,000, the board-mount lens is provided by component manufacturers at wholesale pricing, resulting in much less impact to dome camera pricing. We believe this release will help to strengthen ImmerVision's position against the recent wave of low-cost panoramic offerings, from manufacturers such as Vivotek, ACTi, Pixord, and others, many of which we believe are powered by PanoGuard or Intersil fisheye correction chips. These cameras have a significant cost advantage versus ImmerVision, with some selling as low as $425, easily half of the price of an IMV lens plus box camera ($1,000+). Most of these low-cost options are integrated domes, as well, simplifying installation and improving aesthetics. If ImmerVision's board-mount lens design can be incorporated into similar form factors at similar price points, it should serve to strengthen their position.